Please allow approx. 2 to 3 weeks for this item to ship. The MSR147WD, which is equipped with Bluetooth Low Energy (BLE) and a memory that is capable of storing 1 million measured values, enables you to reliably record and wirelessly monitor physiological parameters such as skin temperature and moisture level over long periods of time. The mini data logger has 5 connections for plug-in humidity and temperature sensors. The sensors supplied by MSR Electronics GmbH can be inserted and removed individually. Due to the automatic configuration feature, the data logger instantly recognises when a sensor is inserted. The calibration data is stored in the relevant sensor. You can retrieve the measured values online at any time by means of BLE or USB. 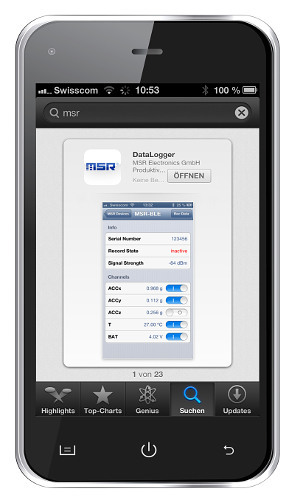 The MSR DataLogger app allows you to start and stop data recordings remotely, to read out the measured data on your smartphone and to transfer it to the MSR SmartCloud. Configure your own custom MSR147WD variant here! With a few clicks you are able to select and send us your order or request a no-obligation quotation of your desired MSR147WD. General technical data on the MSR147WD. Sensors measuring air pressure and 3-axis acceleration (static) are available as internal sensors. Five connections (IP 60) for plug-in, external, pre-calibrated humidity and temperature sensors in cable lengths of 0.20 m, 1.00 m or 1.60 m and a cable diameter of 2.2 mm (black cable, up to +75 °C). A cable diameter of 1.2 mm (white cable, up to +200 °C) is available on request. 3. General technical data on the MSR147WD. Memory capacity: Over 1 000 000 measured values. Key: Set bookmark or start and stop recording. The battery is charged via the USB connection. PC software: Free Setup, Reader, Viewer and Online software (Windows XP/Vista/7/8/10) to record and evaluate data. All measurement parameters can be rapidly transferred to a PC via USB connection both during the measurement operation and once the measurement task has been completed. Thanks to the integrated clock (RTC), data from as many MSR147WD units as required can be synchronised and merged into a single data record. Standards: The MSR147WD complies with EU Directives RoHS/WEEE. Question: Good morning, I was just wondering if there was a way to get rid of the LED. The application requires that no light is emmited. Unfortunately on this particular logger the LED can't be disabled. It blinks blue every 5 seconds while the logger is recording.